You might find it odd that we’re moving forward with our From There to Here series in light of Nine of Cups’ impending sale, but this tale isn’t about endings. On the contrary, it’s about life’s adventures and how we chose to live them. They might be a little different in the future, but we guarantee, they’ll continue. Stick around! Trinidad was a wonderful place … hot, humid, tropical, exotic and frenzied. There was always something to do, somewhere to go, people to meet. It was a busy, crowded place, both at the marina and outside. Most cruisers were involved in boat repairs and each other. Mexican train dominoes, daytrips, local restaurant outings, shopping trips, a movie once in awhile … cruisers were busy. 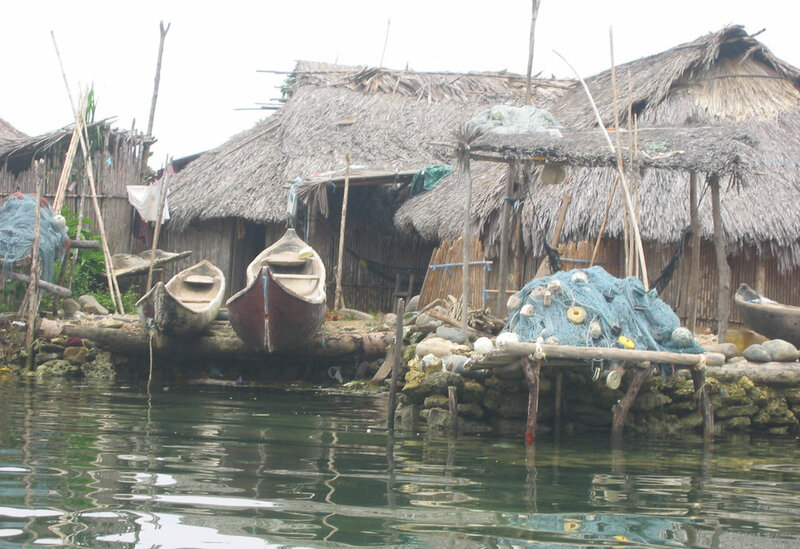 Other than the locals who provided services at the marina, however, we rarely met many Trinis. We went out of our way to meet Trinis when we could. Marcie tutored students at a local elementary school, while David did boat chores using Trini helpers from the marina. We were pleased to have achieved our first destination goal of getting to Trinidad, but it wasn’t enough. As many cruisers prepared to stay in Trinidad for the annual Carnival, we decided to sail west. We wanted more. Venezuela was still moderately safe then though there had been some stories of piracy and boat boardings. We sailed to Margarita, an offshore Venezuelan island to stock up on duty free goods and cheap diesel (12 cents/gallon … delivered) then headed to Puerta La Cruz on the mainland with a wonderful stop in the Gulfo de Caracas. We were overdue for a haul-out and the time and prices were right. We were back in the water by the holidays and Christmas was spent learning to make and eat “hallacas”, a traditional Venezuelan Christmas dish, drinking and eating with cruising friends and generally enjoying the holidays in spite of empty shelves at the grocery stores and limited supplies due to a country-wide strike. We’d planned an inland trip to Angels Falls, but it was canceled due to the strike. It was time to move on. Los Roques and Los Aves are two Veneuzuelan island groups en route to Bonaire and we spent a couple of weeks in each enjoying their unique aspects. 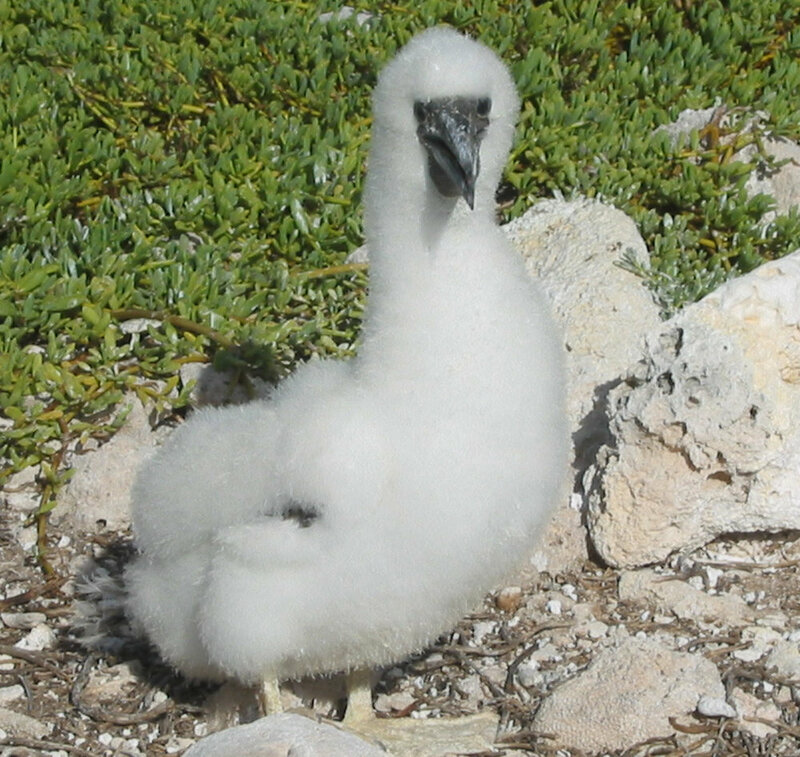 Los Roques is a laid-back national park and the highlight there was the turtle breeding and the booby hatchlings. Click on the thumbnails to make the photos larger! 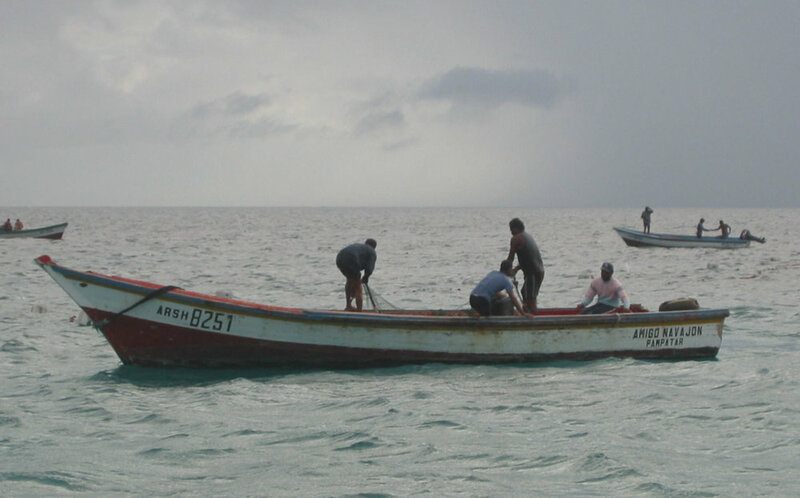 We traded with the local fishermen in the very isolated Aves ... lobsters in exchange for battery charges for their radios. The Aves are windy and the win gens were working constantly, earning us lobsters and fresh fish for each night’s dinners. By the time we reached Bonaire, part of the Netherlands Antilles and a Dutch territory, it was time for some civilization and Carnival. 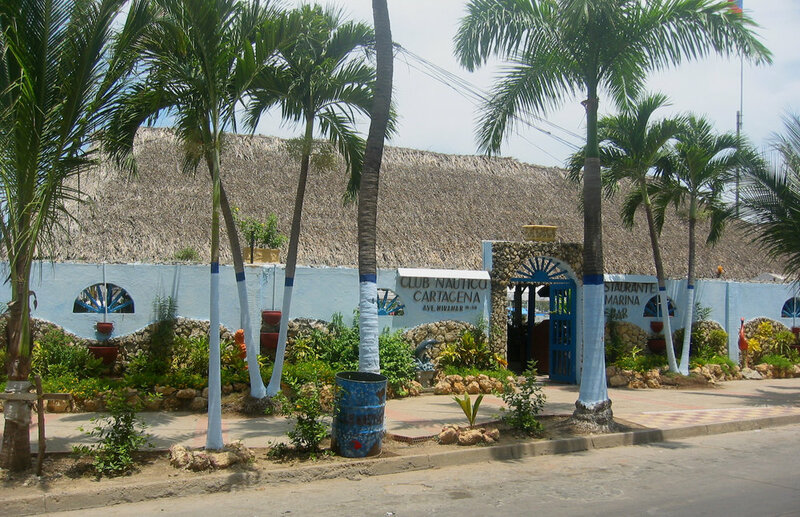 One of the ABC islands (Aruba, Bonaire & Curacao), it was a great island for exploring. In town, we enjoyed all the Carnival revelry. 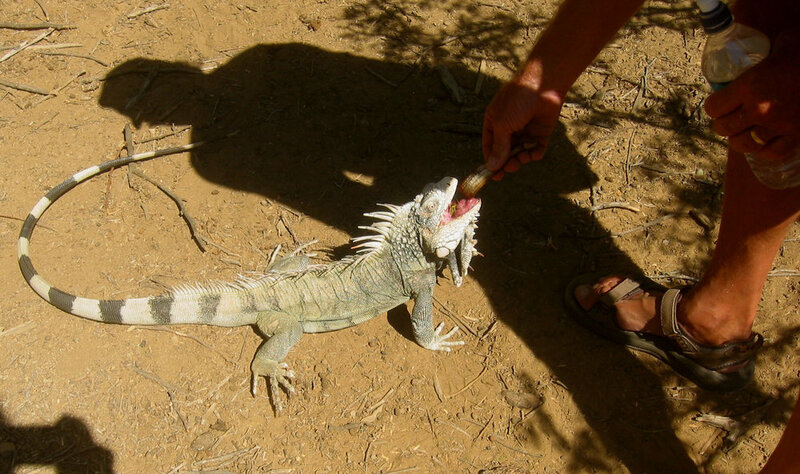 Then we rented a car and toured the island, especially enjoying the Washington Slaagbaai National Park, though the wild, fruit-eating iguanas were a bit intimidating. 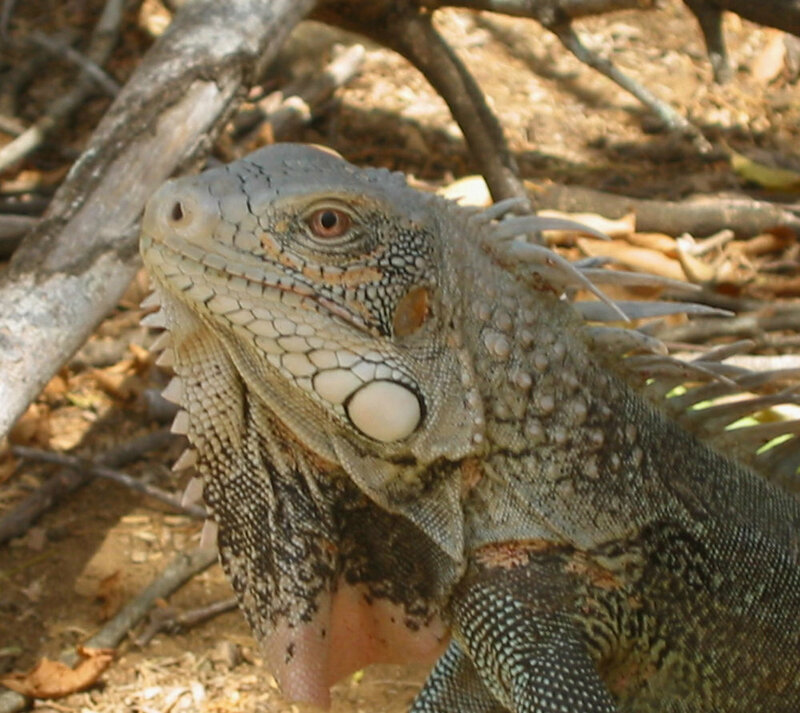 Up close iguana - yikes! A downwind day sail and we were in Curacao, a very Dutch, very interesting island. In fact, we found these western Carib islands much more interesting and welcoming than the eastern Caribbean. Our stay was only a week with most of our time spent in Willemstad, the capital city. The Kulu Huranda slave museum was world class, but most eye catching were the colorful houses along the canals and the floating market, a line up of Venezuelan fresh market vendors who plied their wares along the pier side. We’d visited Aruba before and thought to stop only for a night at anchor without checking in before heading to Colombia … Q flag up and no visits ashore. The local Coast Guard would have none of it and wanted us to check in at their ocean liner dock, pay all customs and arrival fees and return to check out the next day to pay our departure fees. Too much hassle for us … we came about and headed for Cartagena directly … much to the surprise of the officials … and the first mate. The 350nm sail to Cartagena, Colombia is referred to as “the sleigh ride”. All the wind and waves that have come west across the Caribbean seem to well up in this area and the ride, though fast, was tumultuous as we rode to the crest of waves and slid down into troughs. We stayed well offshore based on security risks and arrived in Cartagena at dawn … safe and sound … shaken, not stirred. 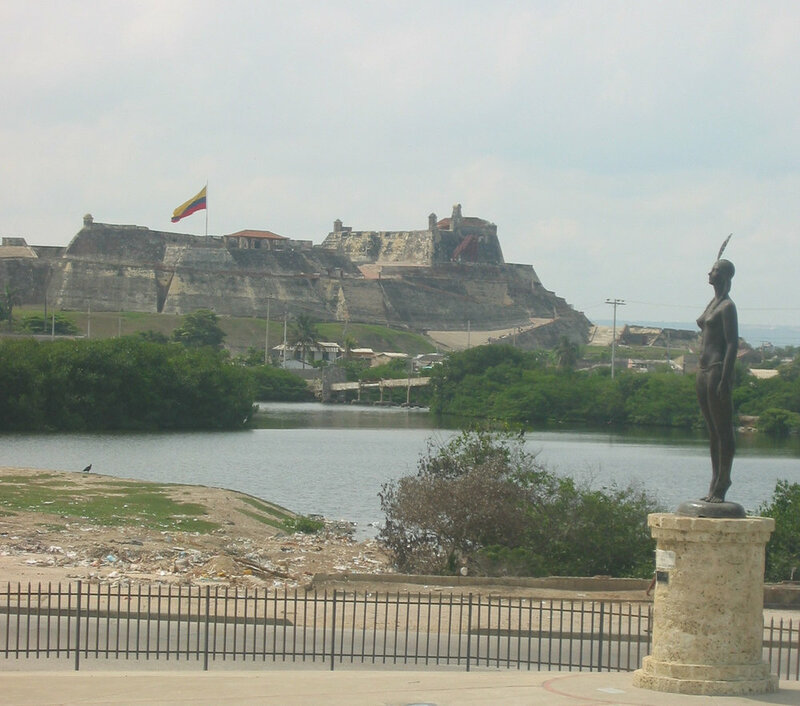 To this day, Cartagena remains one of our favorite cities in the world to have visited. Club Nautico marina was great! 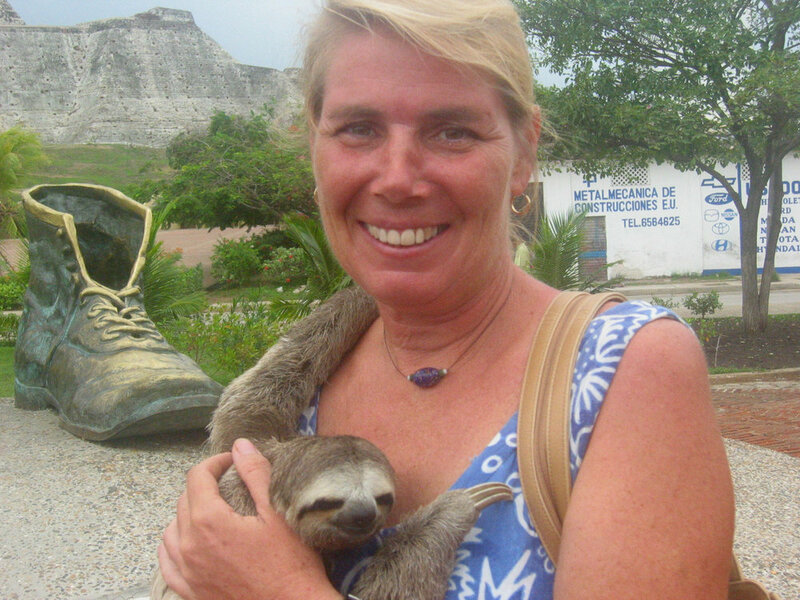 Photo opp with a sloth and an old shoe?? David worked at repairing Nine of Cups’ teak decks and Marcie worked at learning Spanish, taking lessons daily. We spent lots of time walking in this old Spanish colonial city and enjoying the scenery, the food and the people. We were becoming acquainted with South America and we liked it and wanted more. A quick stop at Islas Rosarios, Colombian offshore islands, and an easy overnight cruise and we arrived at the San Blas Islands, home of the Kunas. It’s hard to imagine the Kuna people without the experience of visiting their villages and observing their family life. This matriarchal society thrives on its sales of molas … intricate reverse-appliqued needlework … to tourists. Women wear gold rings in their noses, wrap their arms and legs in colorful beads, wear vibrant wraparound skirts and mola blouses and heavily rouge their cheeks. Comparatively speaking, we’re were pretty bland. We sailed from village to village, enjoying the unique Kuna culture and happily buying their molas. Kuna women do not smile for photos! By the time we reached Colon, Panama, we were ready for civilization again. Colon, however, isn’t quite “the civilization” we’d bargained for. If Cartagena was one of our favorite cities, Colon would rank at the very bottom of our list. It’s dirty, hot, poor, corrupt, dangerous and pretty much unpleasant. We’d decided to transit the Panama Canal and anchored in the “Flats” waiting for our transit time. We made frequent daytime trips into the city to shop and provision, but never felt quite secure. Leaving was the best thing about Colon. As is the custom for first time Canal transiters, we offered to help another sailboat line-handle through the Canal to literally “learn the ropes”. Our experience with this French sailor was a trip unto itself, but we felt more confident about our own transit having experienced it once. Our transit through the Canal and its multiple sets of locks was done in one very long, very hot, very humid, very boring, very anti-climactic day. When we picked up a mooring at the Balboa Yacht Club on the Pacific side of Panama, we breathed a sigh of relief and exhaustion. A toast to Neptune as we enter the Pacific Ocean! One of my favorite anecdotes involves telling David about an article I’d just read in a sailing magazine about a couple who decided to visit Ecuador with their sailboat and do some extensive land travel. “Do you think we could sail to Ecuador?” I asked. “Sure, we just take a left at the end of the Panama Canal and we’re there,” he quipped without missing a beat. And that is how we ended up in Ecuador and continued our love affair with South America. Stay tuned for more South America and lots of inland travel next week.